This is an industrial MIG setup, not a hobby or DIY MIG. It is a 3-phase unit I converted to single phase. The power supply was part of a shop buyout of all their old welding equipment. It was dirty and scratched up but otherwise worked perfectly. 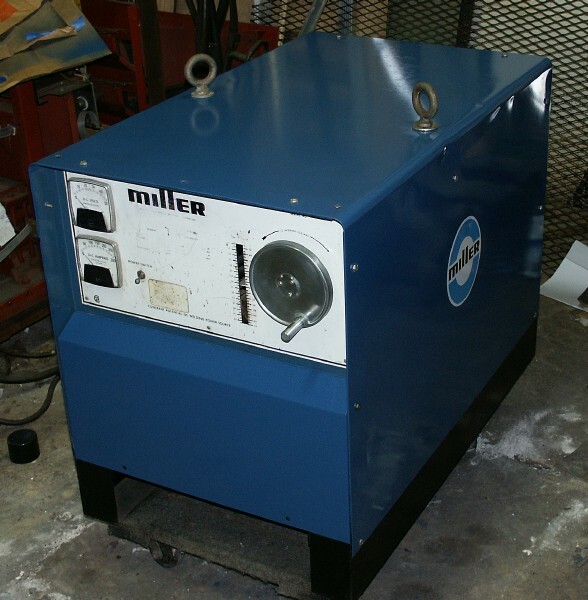 The wire feeder that was with it was actually for a different welder (the one I wanted out of the lot.). The unit was cleaned up, tested and the covers sanded and repainted. This was listed on ebay for $275.00 as a quick sale, there were several calls, but no takers without a wire feeder. I can scrap the power supply for about the above price just for the scrap copper. I hate to see one of the best power supplies Miller ever made go to waste. Voltage (current) is adjustable from 15 to 44 volts. Lower font panel has output connections and wire feeder power and contacter connections. It will weld at 250 amps with a 100% duty cycle. Even at 330 amps it will operate at 60% duty cycle. By most newer standards, this is a 330A unit. Here is the original condition of the unit. It has been repainted, sliding mechanism cleaned and greased and new bolts installed. Also has new Miller logos. I originally planned to sell this unit. In fact I had it delivered to a user. However it produced poor welds for his application and I had to take it back. 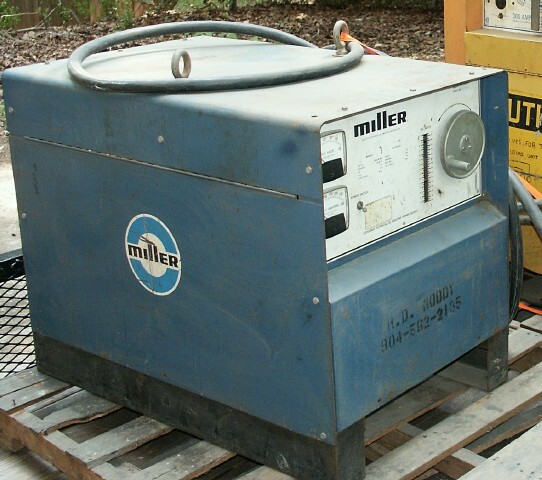 Weldreality mentions the CP-250TS as one of the best welders Miller ever made. So why was the welds poor. I modified it for single phase and achieved the same resilts. Welds were tall, no penetration and wire just exploded when it hit the weld pool. Now welds are much better, so good that I decided to keep it. It is now set up with the old Airco wire feeder. As single-phase I can get about 210 amps out of it. Plenty for my needs. I added 60,000UF capacitors on the rectifier output. That has made the arc even smother; now it is a soft hiss. I ahve welded at about 130 amps for 20 minutes. Opened up the side and everything is still room temperature. 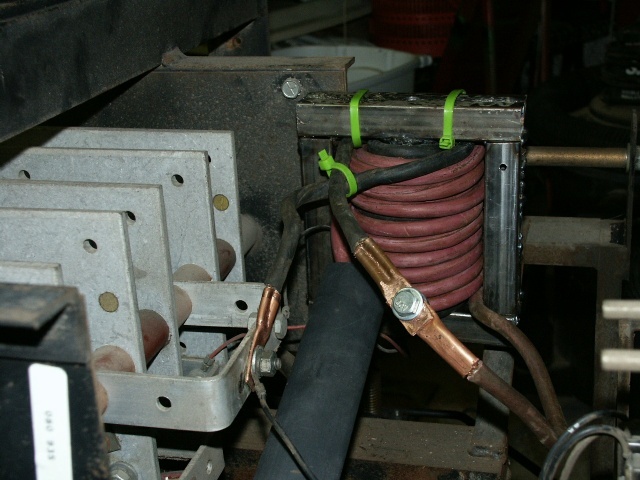 I have since rewired the welder to move the current slope coils after the rectifier. This allows them to also act as a weld stabilizer. Now have tested it from welding thin steel at 20 amps to spray transfer at about 180 amps. Works perfect. Back to main welding page.